In our effort to help single mothers, and women and girls who are trafficked, abused and exploited, PIN supports the “women and girls in crisis” program. The program had been started 2017 by the Good Shepherd Sisters in Yangon. The project provides safe shelter and support programs, such as counselling, informal education and vocational training. 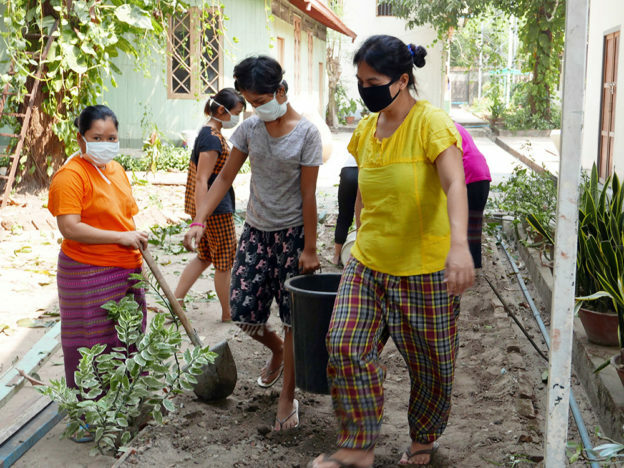 The former buildings of the Leadership Training Program and the old kindergarten at the Good Shepherd Sisters Convent in Yangon provide the rooms for the program. 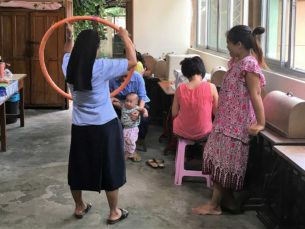 The buildings had become available as the Vocational and Leadership Training Program moved to the new Empowerment Center in Mandalay Myothit. Similarly, the kindergarten for socially disadvantaged children in Yangon had closed. Over the last 10 years the availability of nursery and preschool places in the Yangon’s Downtown neighborhood has markedly increased. When PIN and the Sisters had started the kindergarten in 2006, it had been the only free kindergarten in our downtown neighborhood. PIN helped the Sisters to renovate and refurbish the old buildings. The former Leadership House became a safe house for victims of gender-based violence. Now, it is home to 8 girls and young mothers and their babies. 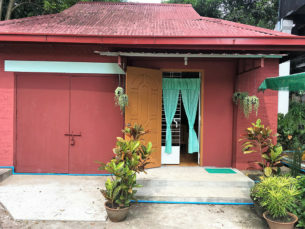 The former kindergarten serves as a safe shelter and accommodation for trafficked girls and women, returning from abroad. During the first 6 months of the program 12 trafficked women and young girls sought the help of the Sisters and stayed in the renovated shelter. Starting 2018 the “Women in Crises” program is run as two separate projects: Anti-Human Trafficking and Gender-Based Violence. The International Organization for Migration assists the returned migrants and survivors of Human Trafficking. People In Need, together with the Good Shepherd Sisters, supports the victims of gender-based violence. The Sisters manage the entire project: ‘Restoring the Dignity and Rights of Girls and Women Experiencing Gender Based Violence (GBV)’.